With the holiday season coming up, no doubt you want to look your best. Worried about painting the town red on a tiny little budget? Check out these best free fashion and beauty apps to download that will leave you looking your very best at the parties to come. ShadeScout is a virtual reality, colour-inspired beauty app that allows users to spotlight makeup colours in different shades and try them on by simply using your camera to point and shoot. ShadeScout then searches and matches for similar colours that can be bought in-store. However, cosmetics such as lipstick, gloss, eyeshadows, blush and bronzers can be tried on first. ShadeScout is a great way to spend less time at the makeup counter and more time shopping! Polyvore is a fantastic little app that lets you become your own personal stylist while browsing thousands of clothes and accessories that are also available for purchase. Polyvore takes trends to the next level and really excels at helping gain wardrobe inspiration by browsing through the app’s editorial collections and fashion collages. 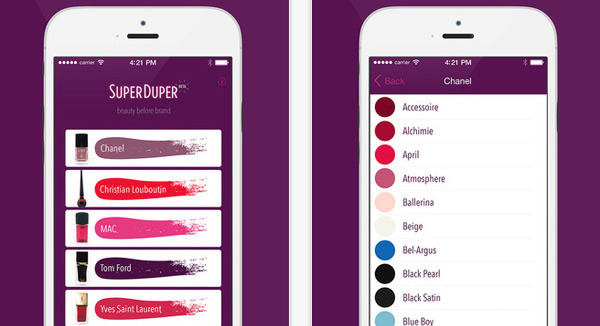 SuperDuper is the perfect app for beauty junkies on a budget. SuperDuper functions as a pocket app that shows generic brands comparable to high-luxury brand cosmetics. Love Chanel but can’t afford it? SuperDuper can recommend something in a similar shade that is a whole lot cheaper. Lyst is retail therapy at its finest. Personalise your feed to display only your favourite designers and brands, and scroll through the app to “lyst” what you like. Once items go on sale, you will be notified. The app also features a variety of high- quality fashion articles for the user’s perusal as well. This app needs to be on every makeup enthusiast’s phone. Sephora Pocket Contour is an app that contours your face for you. All you have to do is upload a photo of yourself to allow the app to determine your face shape. Sephora Pocket Contour then walks you through where you should put highlighter and bronzer to get that perfectly chiselled look. After uploading your selfie, Visada then analyses your picture to develop a personalised comprehensive beauty profile. The app breaks down an assessment of your skin and eye care, offering up suggestions on how to improve your beauty regimen. For makeup and hair, Visada offers product suggestions in specific colours and shades to help you perfect your beauty routine to a tee. This is a free mobile app which allows you to quickly share and discover tips. You can shop organic, up-and-coming brands. Whether you’re looking for all-natural lipstick, a toxin-free nail polish, or a gluten-free cake mix, you can find it here. Browse through our list of ever-growing tips and products to discover your favourites. In addition, Musely motivates you and your buddies to easily keep on track together with your wellness goals. It also has the latest skincare tips, fitness routine, healthy recipes, makeup how-to, parenting hacks or lifestyle tools. Find your VS shade app is a virtual hair colour makeover application that offers you a chance to try a range of 24 shades before you try it for real. All you have to do is take your own photo, draw the outline of your hair and then choose amongst the different shades. Once your hair makeover is complete, you can email the results to your friends. If you’ve ever wanted to turn your favourite vacation photo or a shot of your puppy into nail art, now’s your chance. NailSnaps allows you to use your camera roll or a new image to create customisable manicure designs for each finger. Once you’ve designed your masterpiece, you can purchase it and have it sent to your home. Not so crafty? You can also browse (and shop for) pre-made decals from your friends and nail artists.